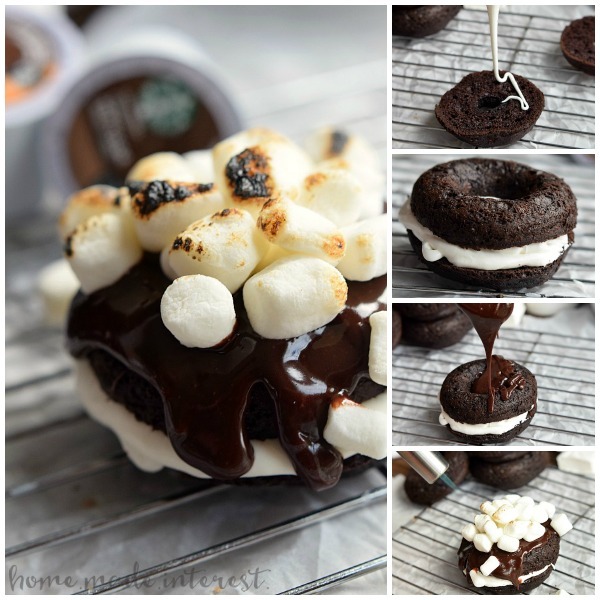 Hot Cocoa Baked Donuts - Home. Made. Interest. 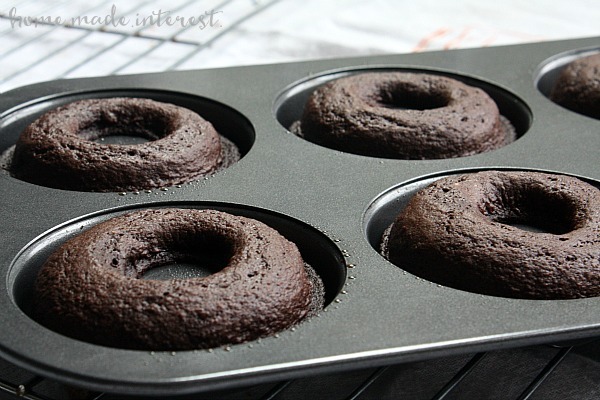 This Hot Cocoa Baked Donut recipe is the best baked doughnut recipe around! 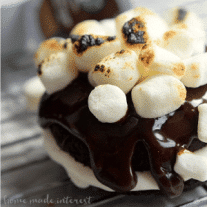 A fluffy chocolate cocoa donut filled with marshmallow frosting and topped with chocolate ganache and toasted marshmallows. Do you ever have one of those weeks when you just aren’t quite sure you’re going to make it? We recently had a record-breaking snow storm up here in Maryland and the family and I were stuck in the house for a week. That’s me, my husband, a 5 year old, a three year old, and two crazy Italian greyhounds. I’m sure you can imagine what it was like. We made a lot of Starbucks® hot cocoa, and watched a lot of movies, and around day 3 I was starting to get antsy so the kids and I went into the kitchen and started baking. I love being in the kitchen with the kids and I so seldom find the time to stop rushing around and just enjoy cooking and baking with them. I know that it won’t be long before they are too busy to want to help mom in the kitchen! 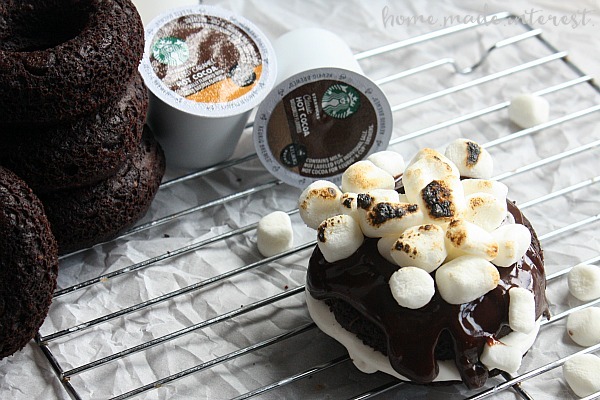 Since Starbucks® hot cocoa and marshmallows were the running theme in the house for the week we made these crazy, over the top, chocolate-y, hot cocoa donuts baked filled with marshmallow frosting and topped with chocolate ganache and toasted marshmallows. Pretty awesome right? Now if you don’t have a donut pan (you totally need one they are so fun!) then you can just bake this recipe in a cake pan. Either way it is gonna be delicious! I added Starbucks® hot cocoa to the recipe in place of the water to make it just like an edible cup of hot chocolate. Starbucks® hot cocoa comes in two flavors Classic and Salted Caramel. Both are created especially for your Keurig® brewer, and each cup is made with real cocoa and non-fat milk for rich, creamy, chocolaty taste. I can’t tell you how much easier Starbucks® Hot Cocoa K-Cup® pods made my life during all of that snow! Assembly was a cinch. I cut the donuts in half, filled then center with marshmallow frosting (so good! ), put the top back on the donut, poured chocolate ganache over it and topped it all off with mini marshmallows that I toasted with a brulee torch. I’m not even going to tell you how excited I was to get to use my new torch, and you should have seen my kids faces when I lit it up and toasted the marshmallows, it may have been the highlight of their day. A fluffy chocolate cocoa donut filled with marshmallow frosting and topped with chocolate ganache and toasted marshmallows. Put batter in a large piping bag and fill each donut cup 1/2 way. Tap pan on the counter to settle the batter. Mix together ingredients until thoroughly combined. Microwave milk until boiling (about 30 seconds). Pour over chocolate and stir until chocolate is melted. Cut donuts in half horizontally. Frost the bottom half of the donuts with marshmallow frosting. Place the top half back on the donuts and then pour ganache over each donut. Top with miniature marshmallows and toast them with a bruleee torch. These look wonderful. I would love to make them but I do not have a donut pan. Any suggestions? Over the last 24 hours we got hit with 10+ inches of snow here in Mid-Michigan. Even though I haven’t had to go out and shovel I am feeling drained. I will have to muster up the energy from somewhere so I can bake these doughnuts. They are perfect for chasing away the winter blues! I can’t wait to make this recipe, but have one question (just to be sure) For the measurements of the buttermilk and Starbucks Hot Cocoa, I’m assuming it’s cups?? Yes, it is cups. Thanks for pointing that out I’ve fixed the recipe. I hope you like them!